Probbly the Kazea, but only as observers. And durring the Galaxtic Exploration Age. Very cool spaceship Hydro! Lovely design. There you go Hydro, my version of your Naucean. I thought some stripes gave it a nice touch, not sure if that would defile your creature. I must say that after drawing it, I thought it was the most beautiful creature I have ever seen. I would petition God to create such a creature. Thanks gec05! It looks great! lol, yeah I guess it was, did you have any idea your creature thread would be so popular? Nope But but that early popularity spurred me to make more drawings. Thus it became more popular and even more detailed. So in a sense it never would have gotten to detailed if not for the communites intrest into it. So thanks you guys for making me want to do more. 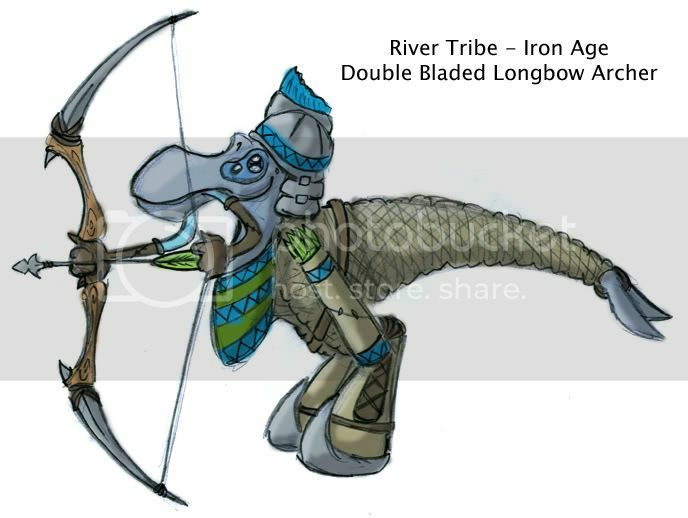 Here is a River Tribe Double Bladed Longbow Archer during the Iron Age. Even though the Double Bladed Longbow was made during the Bronze Age the Iron version was much stronger in hand to hand battle.Unlike say a Quill Sword Warrior the Archers wore much less armor and just had padded armor and an iron helm. Durring battle archers were known to retreat to the water if their double bladed fighting failed. They would drop their bows and helm and swim away. This may seem stupid but heavily armored Nauceans cannot swim thus they can fight another day. Many Nauceans obtained their weapons through this method. Normally they did not have to retreat and were perched atop stone river towers far up where they could not be reached. Their range was about the length of an Earth Longbow even though they were bigger. But they went shorter because they could not best as much with blades on them. Infact they were quite dangerous cause if they did not shoot you full of arrows then they might just cut off a tentacle or 2. Durring this age it was common for Many Naucean if they had not died in battle to come back missing some tentacles and even in some cases missing a floot. Sadly cutting of a head or tail was a bit to much to recover from. how do u have time to do so much detail and post so many pics..
Acually this one did not take me to long sicne i already had the weapons and armor made up in pervious posts.